Why look at 'the why'? When we talk about the why, people sometimes get worried that it might steer into an overly spiritual discussion. Exploring these areas can and should be spiritual, but it is much more than that. Essentially, what we’re talking about are your fundamental reasons for doing the things you do. These are the things that inspire you, energise you, fulfil you and drive you. They make you happy and resonate with your outlook on life. When people think of you, they can likely associate you with these traits. These reasons give you the emotional fuel to go out into the world and do what you need to do; they enable you to put your stake in the ground. They are your reasons for being…they define your Purpose. Wouldn’t it be brilliant if you could just buy it on Amazon or Ebay, and have it delivered neatly in a box the next day? Unfortunately, life isn’t that always that easy. For some, their calling or Purpose was seemingly clear from the day they were born and they have refined through their lives. It comes naturally to them, without question. Those are the lucky ones! For others, it becomes clear through experiences and life journeys. It is iterated over time (this is me by the way!). And for many others, knowing their Why remains as much of a mystery as who shot JFK or what causes crop circles. They’re clueless about it. Either they aren’t interested in exploring their calling, or they just don’t know how to find it…I expect it’s much more likely to be the latter. This is where ‘Ikigai’ comes in. The Japanese believe that everyone has a hidden Ikigai; and that it is found through deep, meaningful search and discovery. Once found, it is regarded to hold the keys to lifelong wellbeing, happiness and fulfilment. Although it has no literal western translation, it broadly means ‘why I wake up in the morning’ i.e. my reason for being. According to this informative BBC article, the Japanese view Ikigai differently to the way it has been interpreted and popularised in western culture, which has more of a professional focus attached. For the purpose of our journey, we’re exploring the latter. 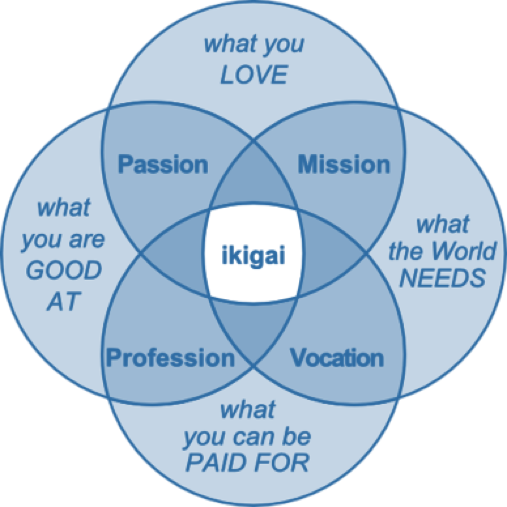 Hopefully, just by looking at the diagram, you can see how exploring each of those circles will help you find your Ikigai, or Why. What I think is most powerful about this diagram is that it demonstrates that to have your true ikigai, each of the areas need to intersect and meet in the middle. To boil that down further, it shows that just because you love something and are good at it (your passion), doesn’t necessarily mean its what you should do with your life. If the World doesn’t need it and/or you can’t get paid for it, then maybe it’s not where you should focus your attention professionally (it can still be a hobby!). Those who know me in my professional capacity as a coach will not be surprised that I'm writing about Ikigai. I love it's holistic and positive approach, and that it has a societal outlook. I appreciate that it is a deeply entrenched and intrinsic way of Japanese life, but has scope and resonance for everyone who wants to explore it. As you can probably tell I'm a massive fan, and have helped many individuals and organisations find their 'Purpose' through it. I've never had someone turn around to me and say it doesn't work for them as a way to approach exploring their future. There are numerous tools and approaches to look into 'the why' and 'purpose', but none better than Ikigai in my opinion. Essentially, you’re going to do the Venn diagram above for yourself by looking at the four key areas in detail. We’ve given you 1 or 2 questions to get your mind stimulated, so grab a large piece of blank paper and start mapping out your Ikigai! Ikigai was first introduced to me by my good friend, Chris Chamberlain, when we were colleagues together. Chris followed his own ikigai and moved on role as a global communications director to become the Sustainability Manager for U2 on their Joshua Tree World Tour. He travelled the world with the band and on their UK stop, generously took time out to record a podcast interview with us. Chris is going to be featured in our Mavericks Spotlights podcast series beginning in the new year, so you’ll be able to hear more about his journey then. Stay tuned! YOUR TURN - Do you have a sense of your Ikigai or are you still searching for it? Leave a comment and let us know your Ikigai!